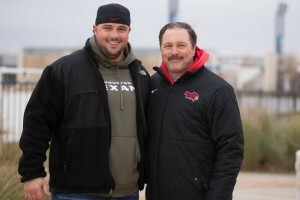 Illinois State football coach Brock Spack. Aggressive, driven to succeed and focused, Brock Spack embraced his first coaching position with a zeal that led some to question his methods. His players were girls on the junior class powder puff football team at Rockford East High School preparing for the annual homecoming week matchup with the seniors. Spack wanted to lead. Even more than that, he wanted to win. “I was named head coach because I was such a football nut. I loved it. People were tapping me on the shoulder saying ‘You need to back off.’ I said ‘No, we’re setting a tempo,’” recalled Spack, a Rockford native who at the time was a standout linebacker on the high school team. Spack was far from done playing at the time, as he went on to excel as a linebacker at Purdue University. Yet that high school experience only cemented his desire to coach one day. And coach he has. 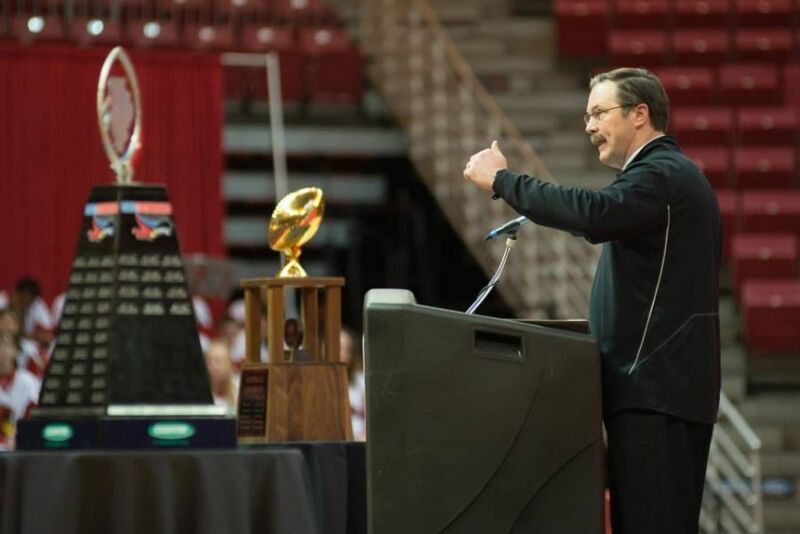 Arriving at Illinois State in 2009, Spack has transformed the Redbird program into a championship subdivision power that came tantalizingly close to its first national championship earlier this year in Frisco, Texas. ISU set a school record for victories in a 13-2 season, earned a share of its first conference championship since 1999, and finished the season at No. 2 in national FCS rankings after a 29-27 loss to North Dakota State in the title contest. Redbird football coach Brock Spack addresses fans at a postseason rally. The current Missouri Valley Conference Coach of the Year, Spack has a 46-26 record over six seasons at ISU. His 19 predecessors were a combined 71 games under .500. “I don’t want to come across as arrogant. It’s not me, it’s this place. This place is special,” said Spack, who referred to the ISU football program as a “sleeping giant” upon his hire. Spack began molding the Redbirds by setting a higher academic standard off the field, and enforcing a credo of work ethic and toughness on it. “The bar was going to rise academically,” he said. True to his word, Spack’s student-athletes are showing strength in the classroom. The football team finished the fall semester with a 2.86 grade point average and half of the players named to the honor roll for the best fall semester on record—even as players also focused on bringing home the University’s first national championship. It is the third consecutive fall semester that the team has improved its in-season GPA. But it was more than just individual players pushing themselves mentally and physically that consistently stopped opponents during the 2014 season. Spack views the team’s success as a combination of talent and intangibles. Spack is equally determined to support his players in his first head coaching job. He is not surprised in the least that he ended up at ISU after a long stint as defensive coordinator at Purdue. His two greatest influences at Rockford East—football coach Craig Stalcup and assistant football and head track coach Gary Giardini—both graduated from Illinois State in 1967. Stalcup died at 37 of melanoma when Spack was a senior at Purdue. Coach Brock Spack talks to his players during a practice on Friday, January 9, 2015, in Frisco, Texas. Spack also kept an eye on the Redbirds, especially during his first full-time Division I coaching job as an assistant at Eastern Illinois from 1987-1990. Spack also knows football. He watched older neighborhood kids play the game in a nearby empty lot before joining the fray of an 8-and-up league a year early. Although his father, Jack, played basketball and tennis, he passed on to his son a love for the Chicago Bears. Television also introduced Spack to a lifelong companion—college football. His passion for the game has not waned, especially given the opportunities at Illinois State. His team has won every game in Hancock Stadium since renovations were completed in 2013. Spack looks forward to many more battles on the field, as he agreed to remain as ISU’s head coach through 2021. After a record-setting offensive season, the Redbirds welcome back Missouri Valley Newcomer of the Year Tre Roberson at quarterback and the Missouri Valley Offensive Player of the Year in tailback Marshaun Coprich. Roberson set a school record for total offense with 4,250 yards, while Coprich smashed previous ISU marks with 2,274 yards rushing and 27 touchdowns. Also returning are key defenders in ends Teddy Corwin and David Perkins and linebackers Pat Meehan, Alex Donnelly and Oshay Dunmore—who may be shifted to safety. As Spack has done in the past to address certain areas of his squad, the Redbirds have added potentially significant Bowl Subdivision transfers to their defense in lineman David Kenney from Indiana, linebacker Reggie Spearman from Iowa and cornerback Stephen Amoako from Oregon. Spack believes the playoff run provided an obvious boost to putting together the 2015 recruiting class. He expects the benefits to manifest themselves even more in 2016, as current high school juniors prepare to make their college choices. Spack views this year’s trip to Frisco and the resulting tsunami of Redbird pride as much more of a beginning than a destination.